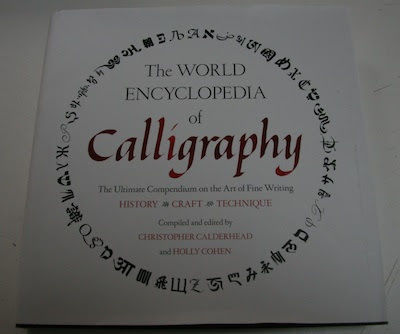 The World Encyclopedia of Calligraphy, edited by Christopher Calderhead and Holly Cohen, was a Christmas gift. Christopher Calderhead is the editor and designer of the Letter Arts Review. I am grateful to him for requesting I write an article about teaching bookmaking to children for the magazine and deeply impressed by his design vision. Being familiar with his work on the Review, I had high expectations for the World Encyclopedia and they were surpassed. 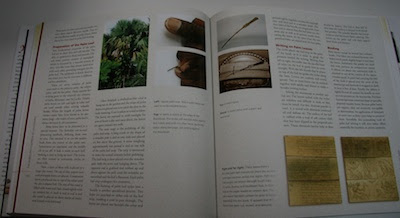 It's a wonderful book, designed for clarity, ease of use, and the beauty of the printed page. 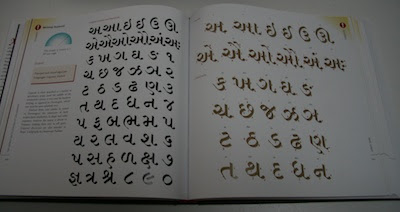 It's full of great information as well as exemplars and guides for lettering. I'd recommend it as a book to read as well as a book to study calligraphic hands from. 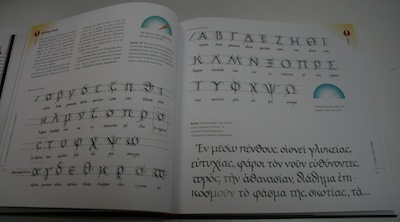 It’s a compendium of calligraphy from all around the globe. The book is intended as a guide to actually writing the major world scripts, so the heart of the book is a series of exemplars by experts in each script. We cover Roman scripts, Greek and Cyrillic, Hebrew, Arabic, Indic scripts, Chinese, Japanese, and Korean, just to name some of the most important samples. The book also explains the use of quills, brushes, reeds, and metal pens, and gives some historical background to each of the traditions described.